On the Water FUN for all ages! Our goal is to provide our guests with a positive paddling experience, while enjoying the beauty of the Little River & wildlife in the hills of Floyd County. Whether first-timer or experienced paddler, On The Water is here to meet your needs. Your river adventure is just a phone call away. We’ve been getting families on the water together since 2009. Owner Daniel Sowers’ guiding experience ranges from Alaska’s glacial cold, to Hawaii’s tropical flows, to the Little River here in his native home, Floyd County. Daniel has spent many years on and around the Little River, adjacent to his family’s farm. 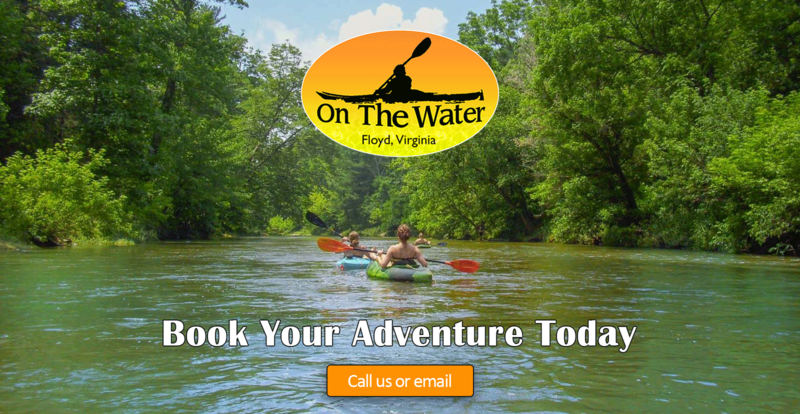 At On The Water, you get an authentic local Floyd river run experience. Let us guide you along the beautiful Little River – one of the best kept secrets of the area. This beautiful and pristine ecosystem is full of gorgeous views and native wildlife. We have everything you need for a paddling excursion on the Little River. We offer canoe, kayak and tube rentals from our convenient riverfront location only a few miles from downtown Floyd. Our knowledgeable staff will make sure that you have the best experience possible. Our fleet of canoes and kayaks consists of various sizes and models to accommodate paddlers of all ages, size, and skill levels. What’s Included with your Rental? We provide everything you need with your canoe, kayak, tube rentals! You can still take advantage of our shuttle service to get you back to your starting point! Groups of 10 or more receive 5% OFF! 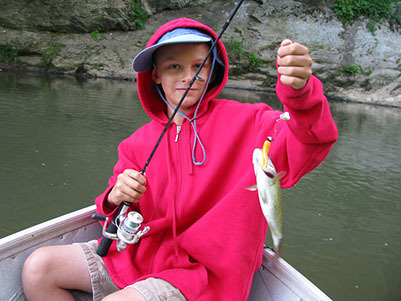 We provide everything you need for a fun afternoon of fishing in Floyd County. For those who want to focus on fishing, we offer guided fishing trips! Let Floyd Co. native Daniel Sowers or one of his staff members share their knowledge of the local rivers and streams and guide you to some of the best fishing holes in the area. Target trout, small mouth bass, and panfish with all rods, reels, tackle, and equipment provided by On the Water. *Fishing trips are for 2 people and last approximately 4 hours. Please contact us for scheduling. On The Water is proud to be a part of some great events in Floyd County. The Little River Run happens every year in June. The event is an annual canoe/kayak float to benefit local charities or non-profits of Floyd Virginia. The Little River Run is a 10 mile mile float through the primitive forest of Floyd County Virginia. This run is a lot of fun and is for everyone. A 3 day event focused on poetry, hiking, cookouts, community, and of course, getting On the Water! Founded by Jack Callan and Judith Stevens – two experienced poets based out of Norfolk, Virginia. Bring your notebooks and your creativity for this retreat! The Little River Poetry Festival features an open mic every afternoon and evening, as well as workshops and featured poets. If you’re looking to sharpen your poetry skills and be around others in your community, the Little River Poetry Festival is the perfect place for you. Get to know fellow poets, work on your writing skills, and experience Floyd, Virginia in all of its beauty. FloydFest is a world music and arts festival held annually near Floyd, Virginia, in the Blue Ridge Mountains just off the Blue Ridge Parkway. The event began in 2002, and spans four days each year with on-site camping and multiple stages featuring rock, bluegrass, reggae, folk, Yiddish, Cajun, or Zydeco, African, Appalachian, and world music performers. 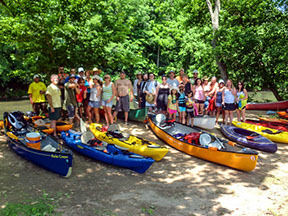 On The Water offers kayaking excursions for festival attendees during the event. You’re invited to volunteer to spend your day helping pick up litter and items in and along a stretch of the Little River. This project is a collaboration of the County, the Town, On the Water in Floyd, the Tourism Office, the Floyd County Chamber of Commerce, and the New River Valley Regional Commission, as well as the regional “ReNew the New” effort. While the New River does not flow through Floyd County, the Little River is a tributary of the New River. Come for an admission-free, family-friendly time on the river that immediately follows Floyd’s Little River Cleanup Day with us at On The Water in Floyd. Come race your own rubber duck, or come just to watch and cheer the ducks on – either way, it’s a great time for ALL! We’re only 10 minutes from downtown Floyd! Take Exit 114 (Route 8 toward Floyd). Go 14.5 miles and turn left on Slusher Store Rd (State Route 705). Proceed about 1/2 mile to the intersection with Thunderstruck Road. From the red light in Floyd, take Route 8 toward Christiansburg. Go approximately 5 miles from Floyd, and turn right on Slusher Store Road (State Route 705). Proceed about 1/2 mile to the intersection with Thunderstruck Road. Online Reservations are coming soon!